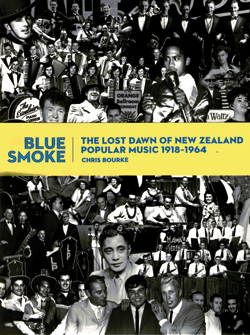 Blue Smoke: The Lost Dawn of New Zealand Popular Music 1918–1964, by Chris Bourke (Auckland University Press, 2010), 392 pp., $59.99. Leading the roll-call of culture heroes is Walter Smith (1883–1960), composer of ‘Beneath the Maori Moon’ and ‘King Tawhiao’. Bourke includes a portrait of the sensitive young Smith plucking at a mandolin, placed opposite an action photograph of Smith’s hot jazz band from a decade or so later; here the men hold their horns and reeds aloft while two women preside over banjo and piano, the latter with proud STEINWAY signage. This was, after all, the era in which the American Paul Whiteman was set on making a lady out of jazz; Kiwi bands were also determined to show their class, spruced up in tuxedos for the lens of the studio camera. Roving through the well-illustrated, large-format pages of Blue Smoke, you realise that many of these musicians took their art very seriously. Bourke takes delight in revealing, for example, that Sam Freedman, writer of such classics as ‘When My Wahine Does the Poi’, published a series of practical guidelines for would-be songwriters. Blue Smoke charts the many battles pitched in the support of our music. Some outbursts, such as a 1936 letter to Christchurch’s The Press denigrating jazz as ‘ghastly, croon-jazz-blare-baby-doll American rubbish,’ can be dismissed with a smile; other responses involve more complex issues, and Bourke brings careful scholarship and shrewd analysis to tracking the struggle for an independent New Zealand recording industry in the 1950s. Yet you also sense that this writer enjoys recreating the panorama of the fun and frolics of the various musical playgrounds that hosted our popular culture in the last century. The dance-hall scene is evoked through images such as that of a truckload of Pierrots travelling down Customs Street en route for the Peter Pan Cabaret. There’s also the cautionary tale of an Australian bandleader promptly dismissed by the same establishment for arriving at work drunk, with pie gravy all over his shirt. The shenanigans surrounding the sabotage and sinking of Showboat, the sailing nightclub at Mechanic’s Bay, pre-empt the similar Rainbow Warrior saga of the 1980s with the zippy energy of a musical farce in double-time. Bourke highlights the fact that when times were grim, during the Depression years, the various Community sings allowed a form of communal response, organised through national radio stations. And it’s not the only instance where Bourke, himself a seasoned broadcaster, stresses the crucial role of radio in giving us cultural sustenance. The writer’s solid musical credentials enable him to also chime in with the occasional analytical aperçu, noting at one point, for example, how a rhythmic shift in the bridge section of a foxtrot lifts it from languor. Discussing ‘Opo the Crazy Dolphin’, he establishes it is Bill Langford portraying the laughing lagenorhynchus as a cheeky cockney, while Pat McMinn and the Stardusters offer the cheerleading chorus that speaks for the nation. However, while Crombie Murdoch may indeed tickle the ivories, surely it is a baritone saxophone rather than a bassoon that bobs beneath the waves? In the late 1980s, when I was providing music research for Jane Campion’s An Angel at My Table, it was a joy to feature Pat McMinn’s vivacious, gender-bending account of ‘Somebody Stole My Gal’ given out in her best Doris Day manner. Bourke’s treatment of McMinn and her many other colleagues whose work graces the splendidly titled TANZA record label (it was an acronym for ‘To Assist New Zealand Artists’) is eminently simpatico, based on his own exhaustive interviewing of both the musicians and Dennis Huggard, a pioneer in the rediscovery of this music. And if the book gives the reader a hunger to hear the music that is being talked about, Bourke himself has been playing a lot of it — including rare radio transcriptions — on the eight instalments of his two Radio New Zealand series bearing the title of his book. Inevitably, there is a lot to be covered in a study that introduces itself with the sounds of vaudeville and pianistic rambles in the silent movie houses and closes with a shot of the Beatles, notably ill-at-ease in the company of the beaming Maori Hi-Fives. Readers daunted by the navigation of the main highway in Bourke’s narrative, however compulsively readable it might be, can divert to shorter excursions. These are numerous two-three page sections, focusing on one particular aspect or character, and printed against a slightly grey background. One titled Singing! Shooting! Hypnotism! unfolds the saga of Tex Morton, whose ‘Kiwi Blues’ features the killer couplet of : ‘I don’t like you trying to clip my wing because I’m one Kiwi who likes to sing.’ Another, headed Kiwi Vernacular, tracks quirky songsmiths like Ken Avery and Peter Cape, whose satirical ballads were picked up by When the Cat’s Been Spayed in the 1990s. On the surface the bibliography looks modest, running to 50 items, a number of them in thesis form; look more closely at the end notes for individual chapters, and you will find Bourke has been scouring a vast range of newspapers and magazines, from the expected NZ Listener and NZ Herald to NZ Radio Record, Ohariu-Johnsonville News and Country & Western Spotlight. A book which so easily could have been reduced to a gibbering carcass by the theoretical lash of Academe, is instead very much the full-bodied story of the people who made the music. There are no vocal-spectrum graphs here of Mavis Rivers’ voice singing “Candy and Cake”, such as the one the academic music historian David Brackett provided when delving into one of Hank Williams’ songs.1 Bourke has not invoked Theodor Adorno, Simon Frith or other theoretical musicologists, or got into a tangle of speculation over issues of social geography. Curiously, though, we are not always told the date of some of the musicians’ deaths. Perhaps this was an oversight on Bourke’s part, or information he was unable to obtain, but, then again, perhaps it can be seen as an attestation that these pioneers of our culture are still in a sense with us, forming an integral part of the continuing weave of our country’s songs and music. 1. David Brackett, ‘When you’re lookin’ at Hank (you’re looking at country)’ in Interpreting Popular Music, University of California Press, Berkeley, Los Angeles London 1995, pp. 75-107. WILLIAM DART is an arts journalist, commentator and critic, who regularly contributes music reviews and commentaries to the New Zealand Herald and to Radio New Zealand Concert. He is also the editor of Art New Zealand, and has lectured in music at the University of Waikato.